Hi @Jon Olson. Please provide more details about your machines (OS, 32/64 bit, Synergy version installed, connected to the network via Ethernet or Wi-Fi, specify which one is the server). Also, post a screenshot of both machine's Synergy interface and the Server Configuration interface on your server machine. For client machines, it'll be normal for them to be on "synergy is starting" state if they are still trying to connect. I noticed that the network which both machines are on is 172.26.x.x. Is that a work network? Is it through Ethernet or Wi-Fi? 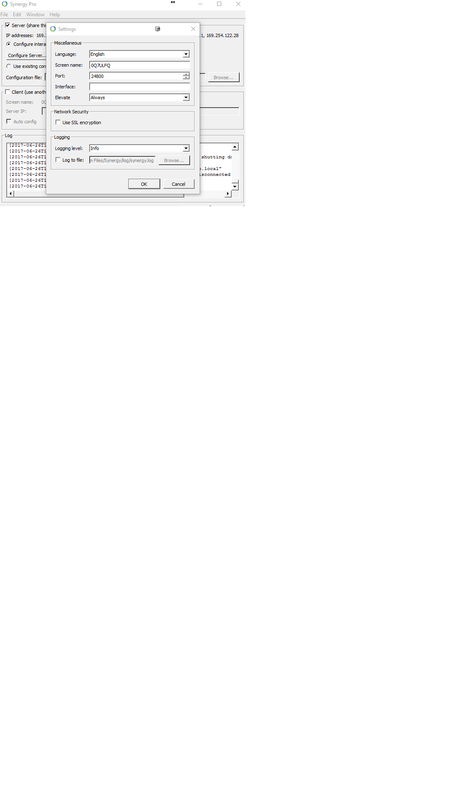 Yes its our Corp LAN, off the same switch on the same VLAN and able to ping. I see. Can you try using v1.9.0-rc3? You can get it from Download Synergy 1.9-rc3 (Fixes the macOS WiFi lag bug) forums thread. 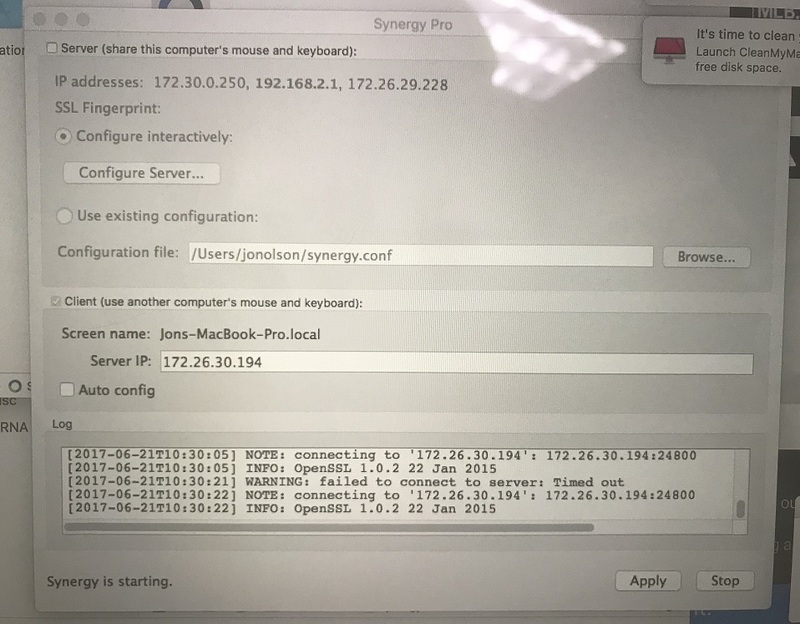 That is due to Mac's system not allowing Synergy to run after sleeping, hence re-connection doesn't take place. Do you have a lock screen when it boots back from sleep? And when you unlock it, does Synergy reconnect automatically? Can you try the steps on macOS Sierra: Open items automatically when you log in kb article from Apple Support site? I did that and added synergy. Same problem exists. Can you try elevating Synergy on your Windows machine? 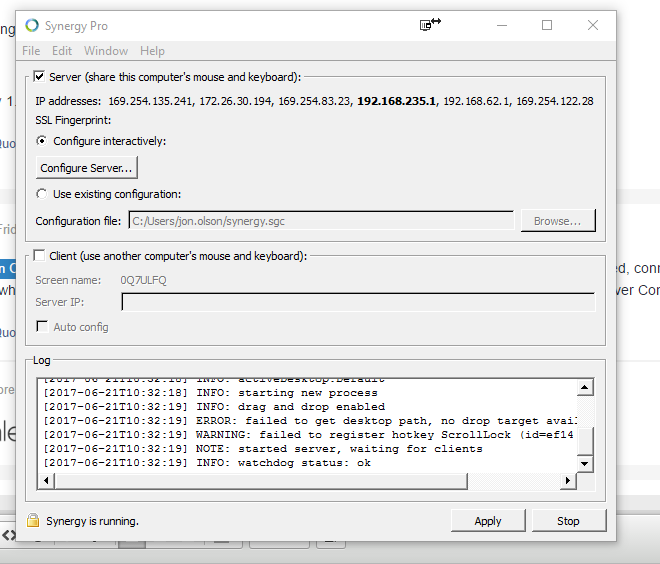 Before your Windows machine goes to sleep, do you have Synergy opened (not necessarily be the active application/in-front)? or you have closed it by clicking the x button? Can you try hiding it instead? Click Window then click Hide. What is that icon on the left side of the minimize button for? would debug logs help to troubleshoot? Do you use Teamviewer Quick Connect to control other machines? or for others to control your machines?